Review of Anchor Small Beer | Beer Apprentice - Craft Beer News, Reviews, Interviews and Info. Hi guys. Welcome back to another craft beer review. For today’s tasting I’m going to be trying the Anchor Small Beer produced by the Anchor Brewing Company located in San Francisco, California. Even though Anchor was a brewery that helped me cut my teeth into the world of craft beer I, for some reason, failed to ever give the Small Beer a try. Well, all of that is about to change I guess. From the website, anchorbrewing.com, I found this commercial description of the beverage. 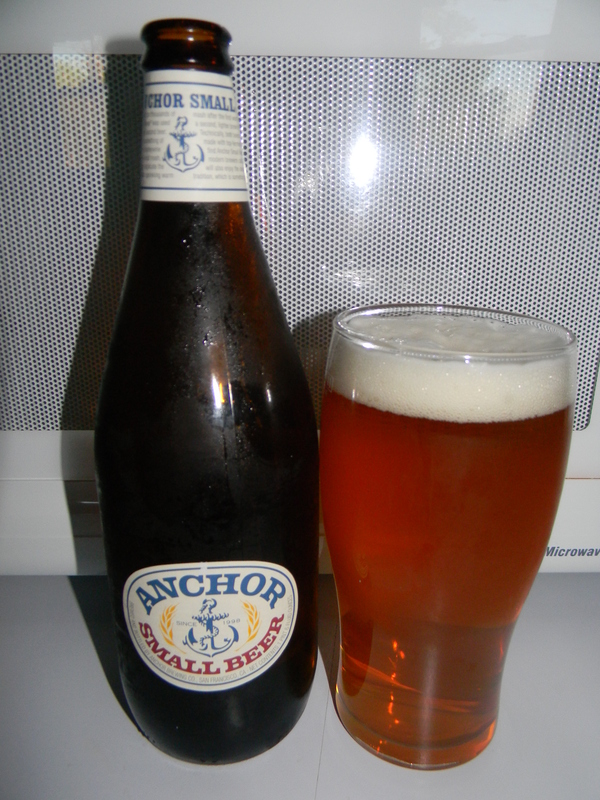 A unique brew reminiscent of an English bitter, with a light amber color and lots of hop character, Anchor Small® Beer is certainly not small on flavor. Made from the second runnings of our Old Foghorn® mash, Anchor Small® revives the ancient brewing tradition of creating two distinct beers from one mash – a sweeter, stronger and more expensive barleywine made for sipping, and a more plentiful drinking beer. We sprinkle warm water over the Old Foghorn mash after the first “wort” has run off, creating a second, lighter brew. Technically, both beers are “ales” because they are made with top-fermenting yeast. Like its forebears, the result is an easy-drinking “session” beer. For hundreds of years, the term “small beer” was used in English to describe the lighter, less expensive counterpart to barleywine. In our revival of this ancient tradition, Anchor Small® Beer is resourcefulness at its best – beer begets beer. Ok. Sounds good. Let’s sip. This beer came in a 22 oz. bottle and it contained a light ABV of 3.3%. It poured a clear, orangish/yellow color with a decently sized white head. The texture was mostly smooth and soft. The retention time was solid, however the lacing was a bit underscored. It was still alright though. The nose had hints of white bread along with tones of unsalted crackers and wafers. It also released wafts of fresh grain and grasses. Undertones of earthy hops added a touch more complexity as well. The nose seemed a bit muted, yet it was pleasant and balanced fairly well I thought. Savors of doughy biscuit began the taste. That was quickly followed by more grain and grassiness. A very light flavor of lemon citrus added the most minute pucker, while more wafer and cracker tones pulled it back down and rounded it off. A light hoppiness made it the slightest bit bitter, but that dissipated rather quickly once I had a sip or two. The mouthfeel was medium to mostly thin bodied. Very crisp, smooth, refreshing and thirst quenching. It was a touch watery, but the carbonation was good and an ok amount of flavor was left behind after each gulp. Overall, I found this to be an ok beer for what it was. Basically, to me, it’s a great sessionable, quaffable Summer beer. One to be had after a hot/humid day of play or labor. A person could definitely pound several of these at one time and not even bat an eye. It’s a little shy on flavor, but that’s quite alright. It still has a ton more to offer than the mass produced “macro” lagers that are out there. So, with that being said, if you have the opportunity to try the Anchor Brewing Company Small Beer don’t hesitate. Pick it up and see what you think. I’d bet that you will be surprised.